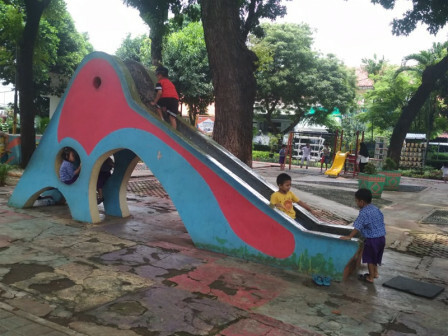 Manggis Children-Friendly Integrated Public Space (RPTRA), Kemanggisan Urban Village, Palmerah, West Jakarta holds activities for children at early age to learn reading, writing, and counting.
" It is good for children's growth and development"
Cimanggis RPTRA teacher, Sri Pujiastuti said this activities has been started since January and now it is held routinely on Tuesday noon. "Around 10-15 children together with their parents come to study in this RPTRA every Tuesday," she mentioned, Tuesday (4/9). One of the parents, Dewi Prasmawati, resident of Kebon Sayur RT 10 RW 03 of Cimanggis Urban Village said this RPTRA helps to prepare their children before entering kindergarten through its study program. "It is good for children's growth and development. So, I take my 4 year old child to play and study in here. Together with children at his age, they learn how to read, write, and count. I believe it can help them to be independent and build their social skill," she conveyed.